If you drink energy shots, try theine instead of caffeine for an energy lift without jitters or anxiety. Dragon Pearl’s Super Natural Energy tea shots are made from potent organic Taimu Mountain Mao Feng whole leaves, brewed into a super-powerful fresh green tea concentrate. The equalavent of three big, strong cups of fresh green tea is in each 2-ounce green tea energy shot. Feel better and stronger every day. Highly concentrated natural Theine provides healthy, jitter-free energy without anxiety that comes with chemical caffeine or too much coffee. I think that the writers for the Dragon Pearl website must have seen my garage! I have to admit that I really had my doubts about this energy shot. I haven’t tried those other energy shots because I feared the nervous, jittery feeling that some have reported after use. I also feared the crash that would come in a few hours! But, so far… so good! I consumed this shot about an hour ago – just before walking to my daughter’s school to pick her up from choir practice. It’s quite a hike – while the school is only a mile away, the hills between our house and my daughter’s school are quite steep! Usually, after I get home after this little jaunt, I am wiped out for about a half an hour or so, but, I’m not feeling that way at all today! I feel like I am at the same energy level that I was before the walk! These 2 ounce shots of energy are quite tasty. They taste a lot like grape juice! There is a little bit of berry taste in the finish that lingers well into the aftertaste. It’s quite good. That being said, there really isn’t a lot of green tea flavor to this shot. I have a feeling that this was created for those who may not find green tea particularly enjoyable but wish to enjoy the beneficial (and energizing) properties of green tea. There are other benefits to this shot as well because the fruit juices used here are superfruits: pomegranate, Concord grape juice, blueberry juice and Acai juice. As I said before, the dominate flavor is the grape, but I can also taste notes from the pomegranate and the berries, especially at the tail. Well, I had planned on coming back six hours later, but, I got busy doing other things. (Sorry!) Anyway, I am here to tell you that I did not experience any “crash-like” feelings. Not that I would really know what they were like, having not ever experienced the crash from those other energy drinks. But, I didn’t feel completely drained, if anything, I feel more energetic than I usually do at about this time in the evening! 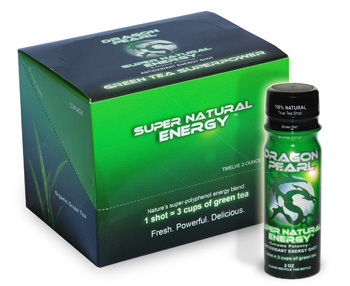 KUDOS to Dragon Pearl – this Super Natural Energy shot is a winner in my book!